My favorite thing about ANY holiday is the food! Well, not just the food, but sharing meal time ona well-appointed table eating familiar dishes with the people you love... that's my favorite thing about the holidays. In my family, we get together on Christmas Eve and make TONS of tamales! We have a delicious Mexican soup called "pozole" and warmed Mexican Christmas punch made with fresh fruit... yum. ANYWAY, WELCOME! You're probably coming over from Joan's blog at "2 Ladies & A Chair" where you saw her fabulous and festive holiday table. SUCH A FUN TABLESCAPE, RIGHT?! Well, Thanks for clicking over here! This lil' blog hop is showcasing 7 gorgeous holiday tables decorated by a few of your favorite home decor bloggers. I hope you are able to pick up some ideas for you to incorporate in your home. I will add links to the other tablescapes at the end of this post so you can check them out. For my tablescape, I was inspired by the colors that I used throughout my home this holiday season. If you have been a loyal reader, then you probably remember that I used burgundy and black on my tree and in my living room. If you missed that post, you can view my holiday home tour HERE. My tablescape is pretty simple and straightforward. It started with these cool plaid plates I found at HomeGoods for $3.99 each. Nice, right? They also don't SCREAM "I'm a Christmas plate!" so I can use them throughout the year for other occasions. After that, my goal was to find a coordinating tablecloth and I wasn't having much luck until I ran into this cool striped fabric at IKEA! I purchased two yards which cost me 10 bucks! Score! I added some garland (Trader Joe's $6) down the center of my table and embellished it with a few pomegranates and dollar store gift boxes! BAM! I have a runner! And there you have it! My holiday tablescape! Thanks again for visiting! 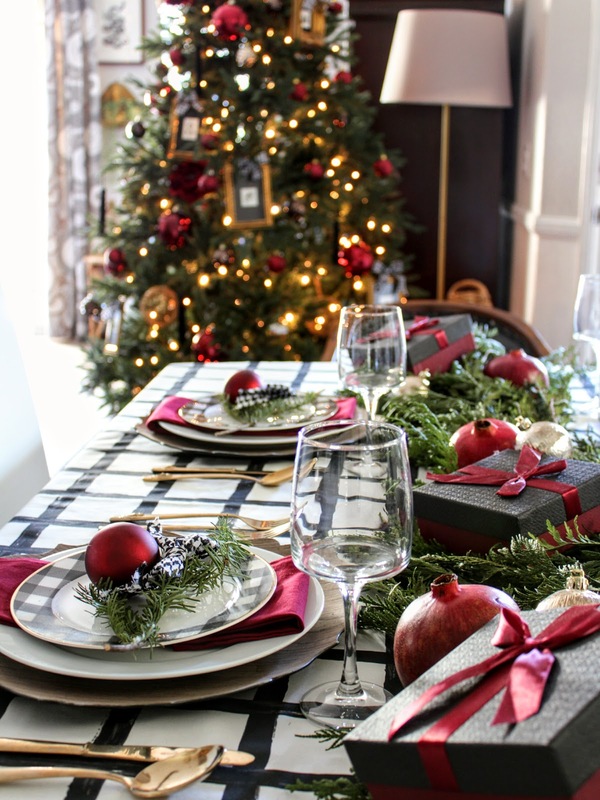 Make sure you go over and visit Sheila over at " Maison De Cinq" and see her holiday table setup! Here is a list of all the bloggers participating so you can go check out these 7 beautiful holiday tables. Ok Oscar!!! Standing ovation, my friend! Those pomegranates are so pretty and I am obsessed with those plates, and that fabric is fabulous! Love it all!!! ���� Bravo!! OK I LOVE everything but the little ornaments with the names written on them are especially genius!!! OMG Oscar this is simply stunning!! 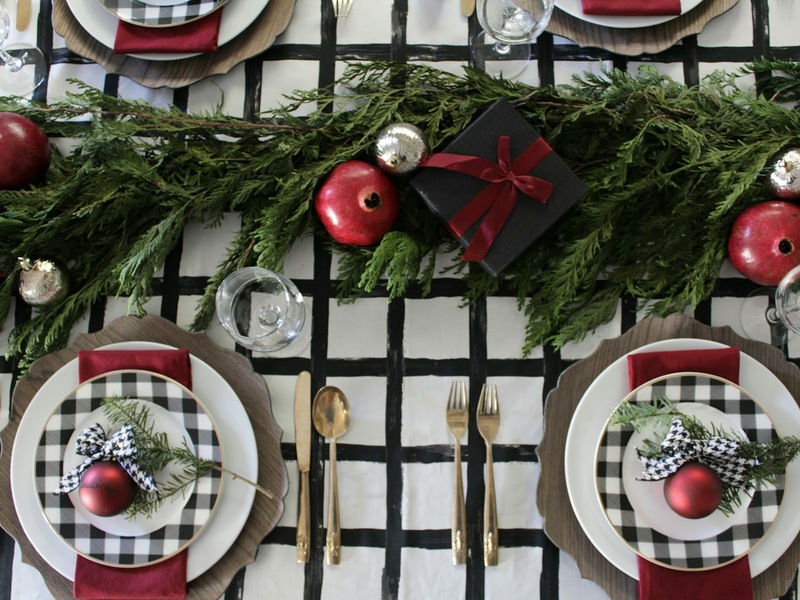 I love how you can make black and white plaid look Christmasy! I adore your color scheme so bold and elegant! and brilliant idea to write names on the ornaments for a place holder!! LOVE!! Oscar, you are truly an inspiration to me! Not only is this tablescape amazing my friend, but your photographs of it are gorgeous!!! Magazine-worthy! 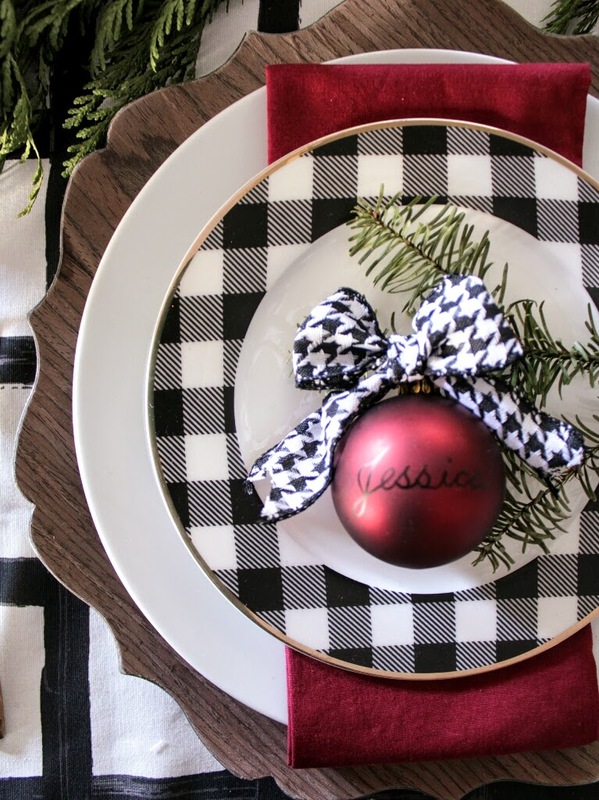 I've been pinning some of them to use for inspo next year, as I love the pop of red, the ornaments as place cards, and especially, those plaid plates! Your tablescape is so fresh and fun! 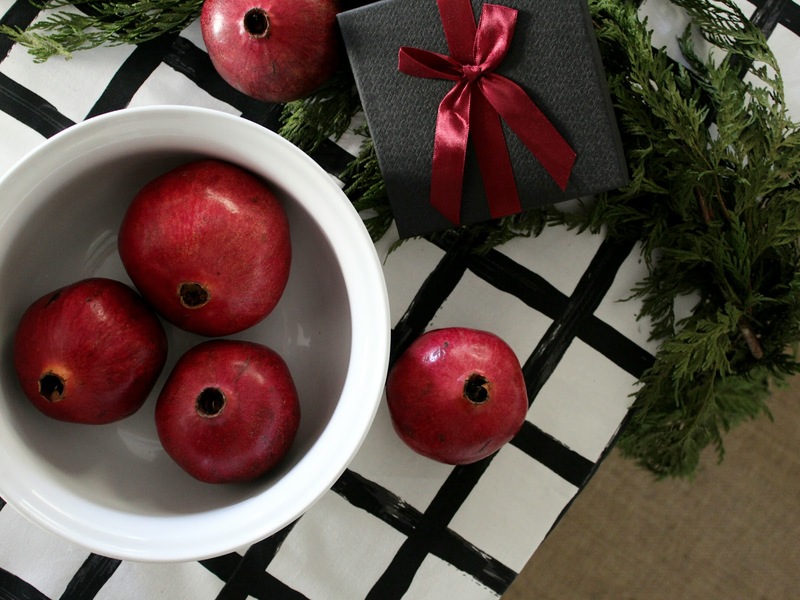 I love how you created a table with some fun elements, pomegranates, ornaments and Ikea fabric! You are resourceful and clever! I'll have to check out Ikea's fabrics, thanks for the tip! Now off to share you on my FB page! Happy Holidays, my friend! I'm in love with burgundy and black combo!! Adding in the greenery makes it super luxurious. Great table! !